Prime Minister Nguyen Xuan Phuc met with President of the Senate Scott Ryan and Speaker of the House of Representatives Tony Smith in Canberra on March 15 during his official visit to Australia from March 14-16. The Australian legislators welcomed the PM, his spouse and the Vietnamese delegation on their official visit to Australia, describing the visit an important hallmark in 2018 when the two countries are celebrating the 45th anniversary of their diplomatic ties. 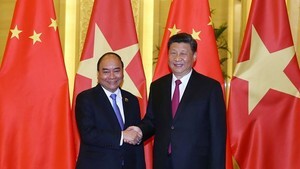 They spoke highly of the results of the talks between the two PMs, especially the signing of a Joint Statement on the establishment of the Vietnam-Australia Strategic Partnership and other important cooperation deals in education-training, science-technology and agriculture, saying these created breakthroughs in the relations between the two countries as well as ratcheted up cooperation in specific areas. “Vietnam treasures and wants to deepen the relations with Australia via all channels, including the parliamentary one,” the PM told these leaders, suggesting their bodies to pay heed to pushing the cooperation between the law-making agencies of the two countries to match the freshly - established Strategic Partnership. The Australian leaders hailed the outcomes reached during the official visit to Australia by Chairwoman of the National Assembly Nguyen Thi Kim Ngan in November 2017 and said they will visit Vietnam at the earliest possible time. The Senate and the House of Representatives always support and provide maximal assistance to the development of Vietnam-Australia relations, they stressed. Senate President Scott Ryan highlighted the role of nearly 300,000 Vietnamese-Australian people to the growth of Australia and said he will continue working to support the Vietnamese community in their integration into the local society and making wealth so they will make continuous constructive contributions to the respective country’s development as well as the bilateral ties. 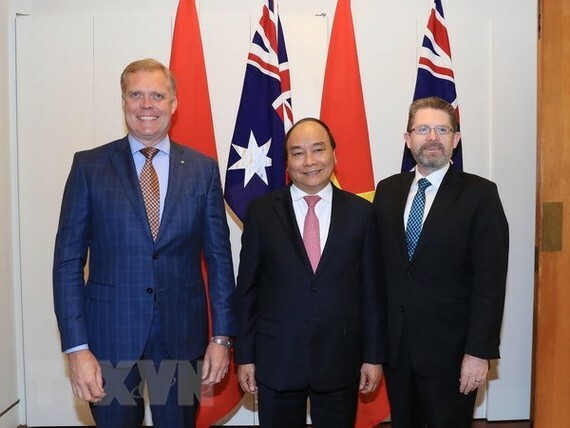 House of Representatives Speaker Tony Smith, for his part, showed his impression at the strong tourism cooperation between the two countries, citing the figure of nearly 500,000 Australians having visited Vietnam in 2017. PM Phuc agreed with the two leaders that education cooperation continues the spotlight in the two countries’ cooperation as evidenced by nearly 30,000 Vietnamese students currently studying in Australia plus 60,000 Vietnamese alumni of Australian universities and colleges, and thousands of Australian students taking part in exchange programmes in Vietnam under the New Colombo Plan. “By accelerating education cooperation, the two countries are working together to build a foundation for their future,” he underscored. Earlier on the day, PM Phuc visited the Commonwealth Scientific and Industrial Research Organization (CSIRO), an independent agency of the Australian Federal Government responsible for scientific research in Australia, and attended an exhibition on renovations and creativity there. The Vietnamese leader welcomed the sound partnership between the organization and the Ministry of Science and Technology of Vietnam, noting that the two countries, with their supplementary strengths, shall cooperate to make the best use of opportunities brought by Industry 4.0. He also suggested the CSIRO continuing assisting Vietnam to develop green, organic and high-tech agriculture.